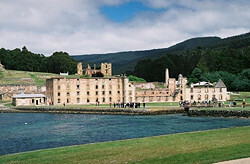 Port Arthur used to be a penal station for convicts which have committed a crime somewhere else in Tasmania and also for children deported to this island who were too young to be useful elsewhere. 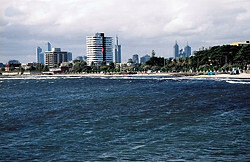 The site is not particularly old according to European standards, however there are only few opportunities like this to explore Australian history now. 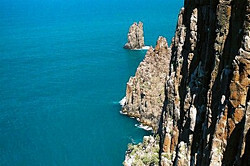 Some of the highest and most spectacular sea cliffs in Australia are located in Tasman National Park which has not been discovered by tourists yet, mainly because getting there basically requires a 4WD car or a bit of a commitment to walk. Freycinet National Park is located further up north and is a peninsula with beautiful beaches and very pretty granite hills. 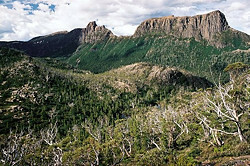 The Overland Track is definitely the most famous bush walk in the whole Australia and many claim it is also the best one. I was very lucky and even though it hailed on me one afternoon I also enjoyed six and a half sunny days. The track can be walked in less but since the most beautiful parts are various side trips, there is no need to rush. I strongly dislike organized tours but reaching the Great Ocean Road without a car is only possible on on of a great number of them. Fortunately, Australia is a very friendly and easy going country and the one day I spent in this way was quite fine in the end. 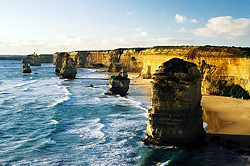 One day tours don't obviously take you all the way on the 400km long road on the Victorian coastline, but all of them reach the biggest attraction, the 12 Apostles.